The Girvanella Band marks the top of the Great Scar Limestone, formed in the Mid Carboniferous and recognised by its darkish colour (indicating impurities) and nodules of algae, as it was formed in very shallow water washed by muds from incoming rivers. 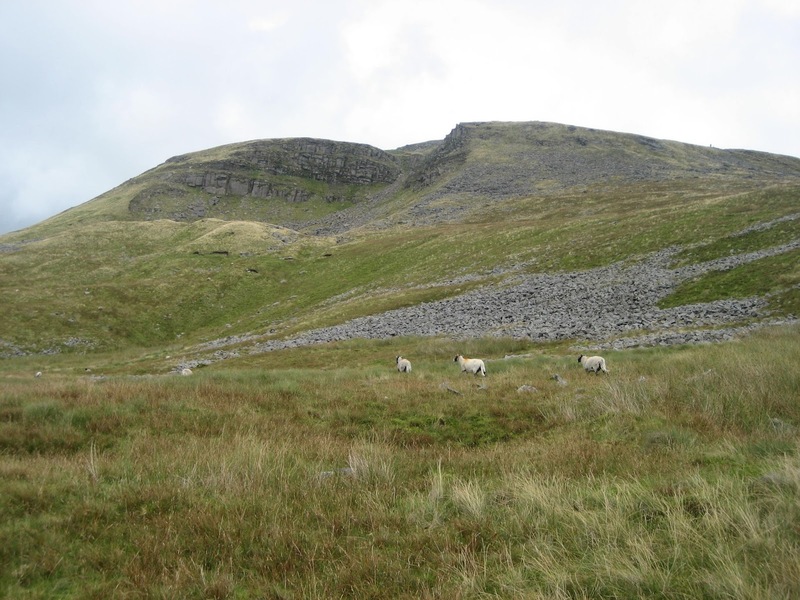 Rising above the top of the Great Scar Limestone is the great pyramid of Ingleborough itself. It is formed entirely of the Yoredale rocks, (named after the old name for Wensleydale, where they are prominent) and the point at which they began to be laid down marks a distinctive change in the Carboniferous. Instead of a relatively consistent, shallow sea – water levels began to fall and rise in a series of cycles, resulting in corresponding bands of rock each dependent on the conditions. 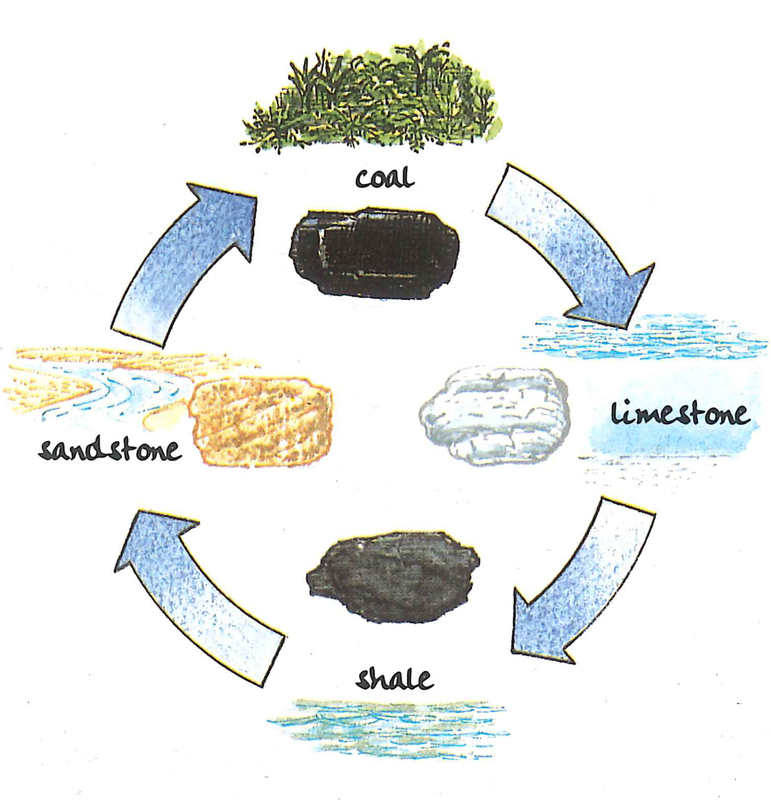 Each sequence of limestones, shales and sandstones is known as a ‘cyclothem’. A typical example would see a clear, shallow sea allowing limestones to be laid down, with shale forming over it as progressively shallow water allowed muds to be washed in. With the water at its shallowest, great deltas pushed in coarse sands and gravels to form sandstone. 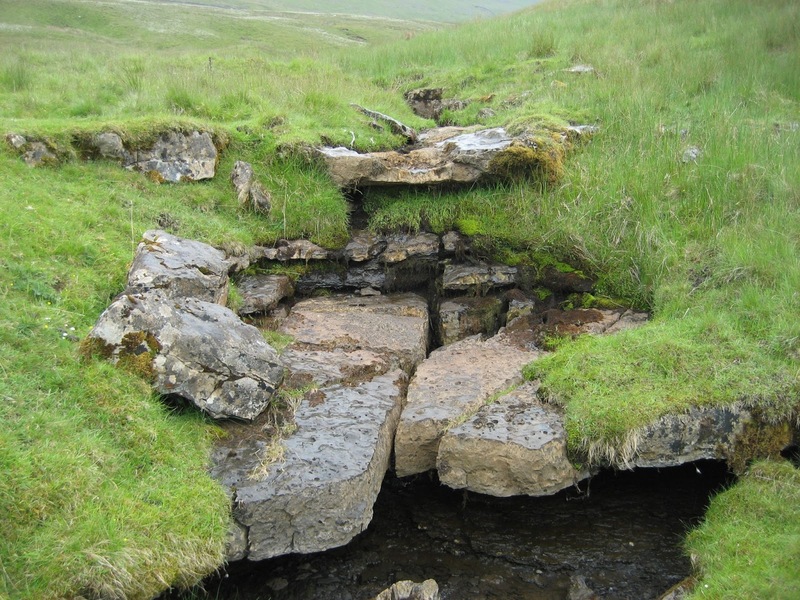 Then, with gradually deepening water, the process began all over again, resulting in a banded series of rocks which can be traced from the pavements below Ingleborough, all the way up to its summit. Very occasionally, conditions became so shallow and swampy that vegetation was allowed to flourish and therefore very thin bands of coal can be present in the Yoredale Series. Also, erratically fluctuating sea levels have resulted in the rocks not always following in sequence: two bands of limestone, for example, sandwiching a bed of shale. 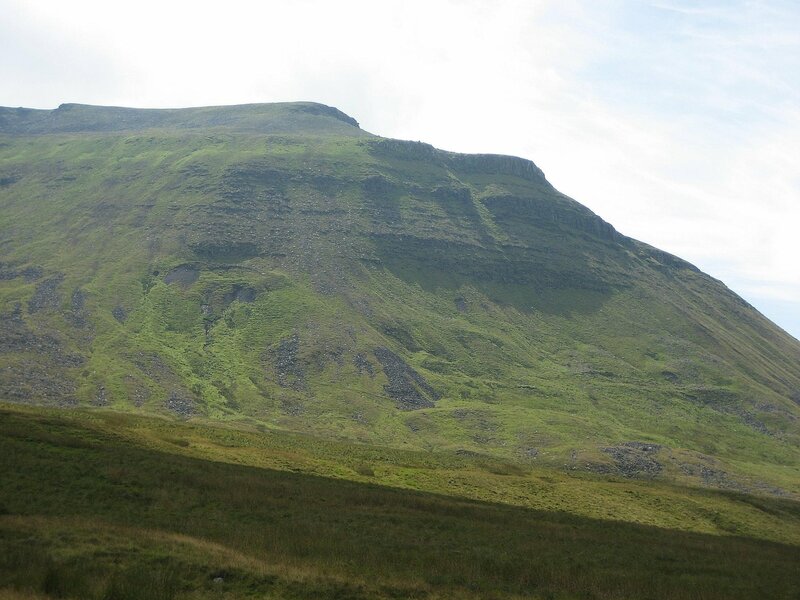 It can be fascinating tracing the Yoredales on Ingleborough, particularly when heading off the main tourist route and up the Falls Foot Landslip. At Falls Foot, a massive slice of the Yoredale sequence has, relatively recently, collapsed down the mountain, exposing the varying beds for easy inspection. 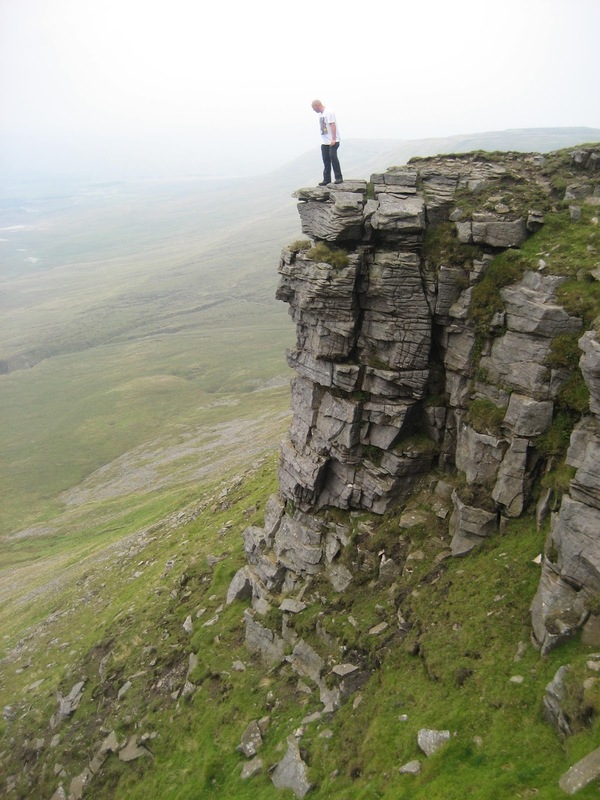 Coming down off Ingleborough’s gritstone summit, the first buttress of Yoredale limestone is known as the Main Limestone. It is less solid in structure than the Great Scar, and as compression during its formation was much less and over a shorter time period, it is usually rich in fossils, especially crinoids. Below it, a spectacular sandstone ridge allows sensational views down over the pavements far below. 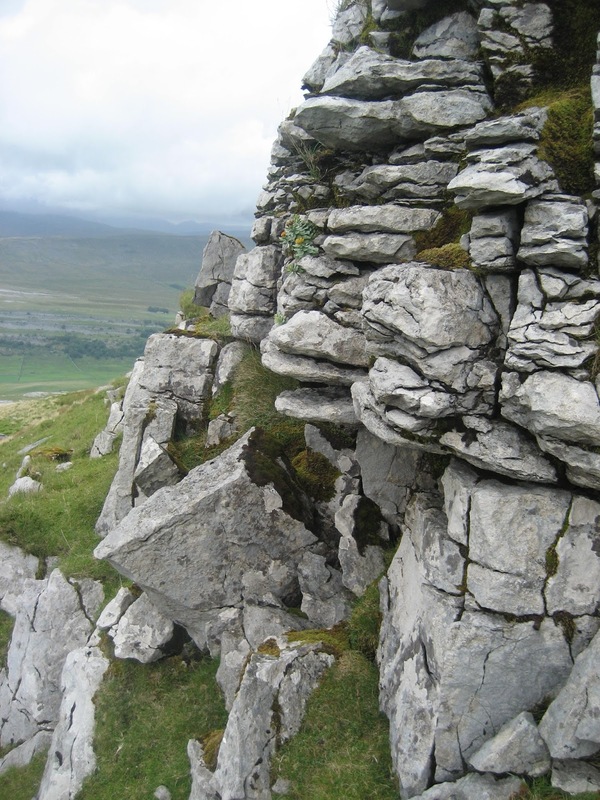 The limestones and sandstones of the Yoredale series provide prominent steps in comparison to the weaker shales that have weathered away, though this is not so obvious on Ingleborough due to the steepness of its slopes allowing rapid run-off, and it is best seen in Wensleydale. There are eleven limestones within the Yoredales, ranging from the Hawes and Gayle limestones at lower levels, up to the Main Limestone just below the summit. In sunlight, the contrast between the dark sandstones and the gleaming white limestones of Ingleborough’s Yoredale beds is a beautiful sight.